This box is a smaller version than the normal seizes. 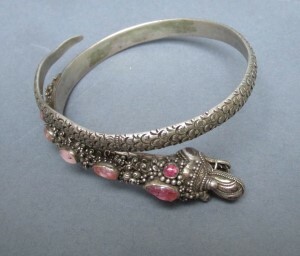 The silver is Balinese silver, which has a content of below 800. This well decorated item was entirely made for the upcoming tourist market in the 1960-70s. 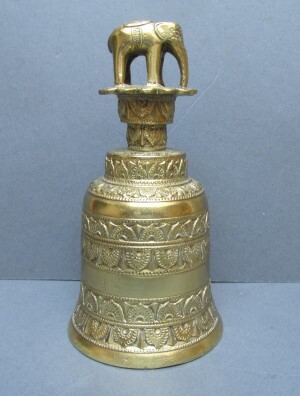 Old temple bell with few ornaments. 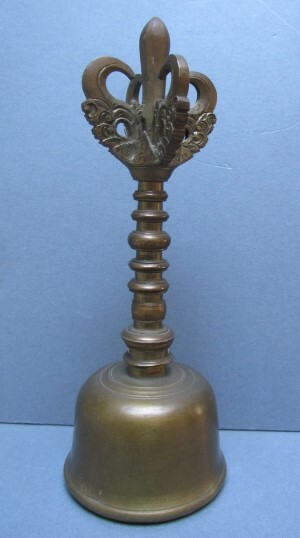 The five-point top is called a "vajra", a buddhist symbol reflecting the male principle of mehodology (upaya) to achieve enlightment. 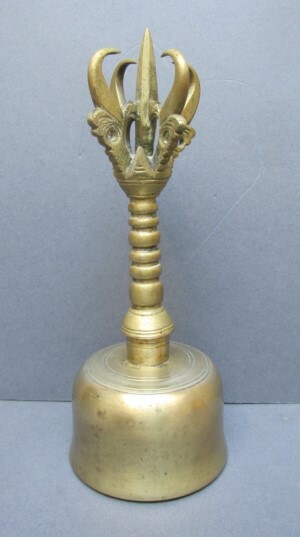 Well preserved old temple bell with beautiful ornaments. 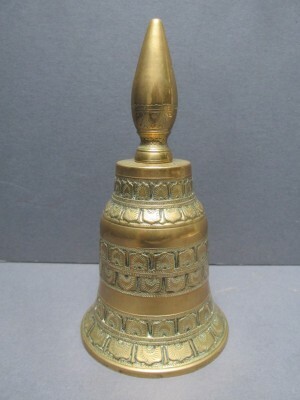 This bell was made and used before 1950. Its condition is still excellent. 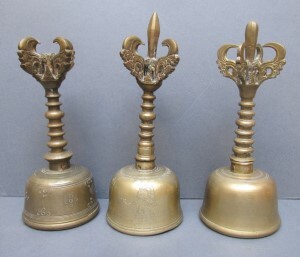 Only Balinese priests were allowed to use these bells during their ceremonies. 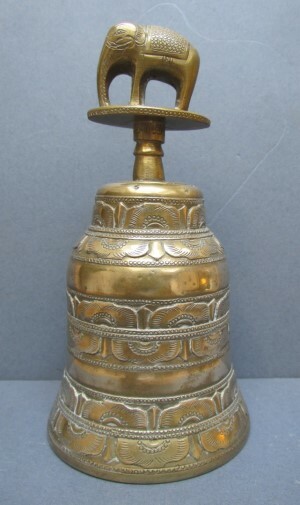 When the bell came into contact with a stranger or when it fell down, the bell was declared unclean and disposed off from the dessa.The five-point top is called a "vajra", a buddhist symbol reflecting the male principle of mehodology (upaya) to achieve enlightment. The deep dark green colour and nice patin show a high percentage of copper. Beautiful sound when jingled. 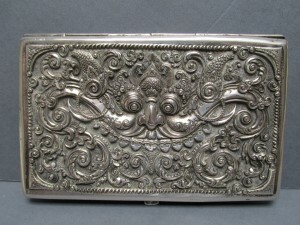 Richly decorated box with Kala head. 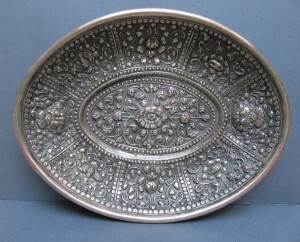 Small but richly decorated offer dish. Perhaps made for children. 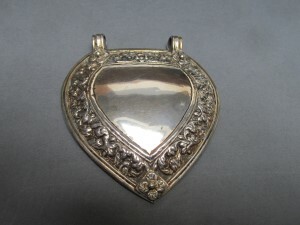 The silver used is Balinese silver, which is not the standard content. 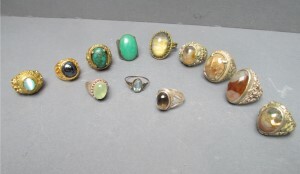 Set of antigue Balinese rings. One is made of gold, two are made of silver with a mark on the inside. The various stones have a certain magical power. These containers were used to store the holy water. 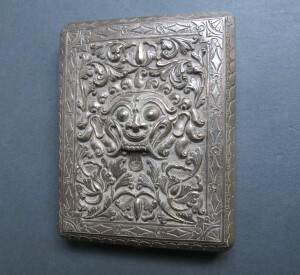 The silver is of a lower standard than the usual standard(960). Holy water is very important in the Hindu religion. It is created through a ritual whereby a pedanda(Bali priest) is in trans, allowing the gods to take possession of the water. The water now has a purifying power. The priest uses this holy water to purify objects and persons to keep the evil spirits away. 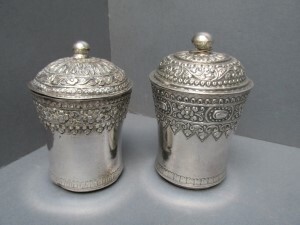 Because of this important role these containers are richly ornamented and made of silver and sometimes gold. 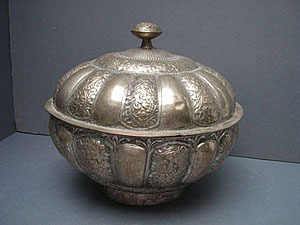 Silver container for holy water used by Hindu priests on Bali during rituals. 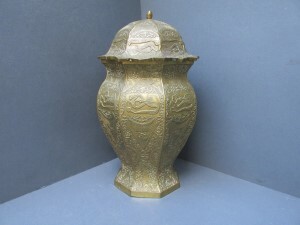 Rare container with nicely decorated lid. The silver is of a lower standard than the usual standard(960). Holy water is very important in the Hindu religion. It is created through a ritual whereby a pedanda(Bali priest) is in trans, allowing the gods to take possession of the water. The water now has a purifying power. The priest uses this holy water to purify objects and persons to keep the evil spirits away. On the outside the guardians of the four wind regions are visible. 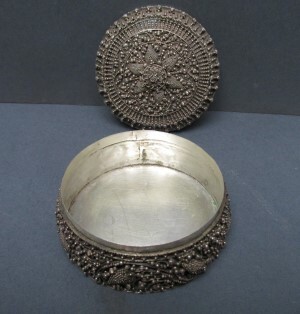 Because of this important role the container of the holy water is richly ornamented and made of silver and sometimes gold. .
Brass container from Sumatra to preserve the leaves from the sirih plant. 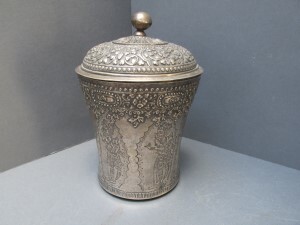 Nicely decorated sirih container in which the leaves of the sirih plant were kept. This container in this form is rare. 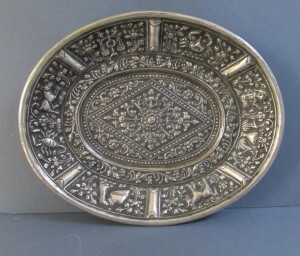 Nice and mint pubic plate, wich was used by young children until the age of 8. Possible locations of origin are Bali, Lombok or Sumatra(Atjeh). Collectors item. 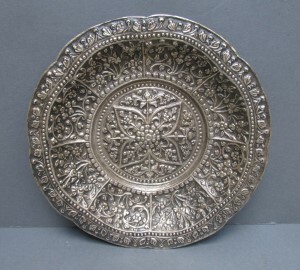 Nicely preserved silver offer dish, which was used to bring the holy flowers to the temple. 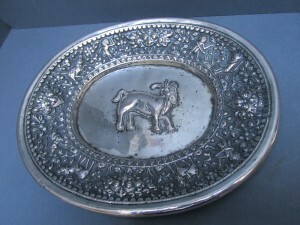 This dish has in the middle an ilustration of a socalled fable animal.This is a creation in the Hindu religion where two animals are combined. Here the creature has the head of a ganesha and the body of a cow. This depiction of a fable animal on an offerdish is very rare. Kala jewelery with both a beautiful moonstone on it. 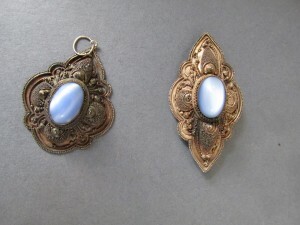 Rare items with the blue moonstones. It is unclear when and where this shell was made. Probably Java (Kota Gede). This shell was very well preserved, considering its condition. 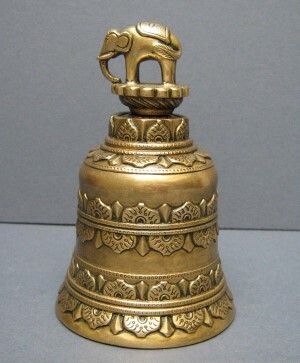 On the last photo some extra info about brass shells. 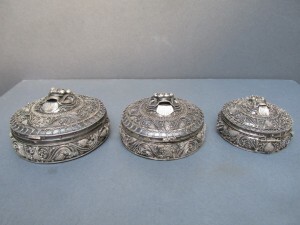 Beautiful set of three make-up containers with detailed filigrain decoration and Kala head. A mirror at the inside. The silver mark under the container indicates the purity of the silver. 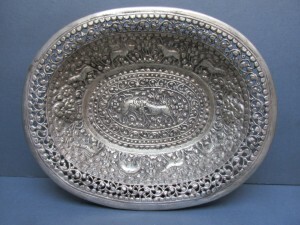 Bowl and cover are nicely decorated with floral motivs. 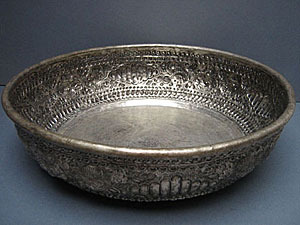 The bowl was most likely used to present pastries or sirih. Made of copper with an upper layer of silver. 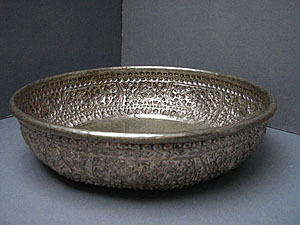 Slighly smaller offer bowl than the one of Tobo 379. Made of copper with an upperlayer of silver. Under the word "KAMASAN" has been engraved. This might indicate the place where this bowl either was used or made. 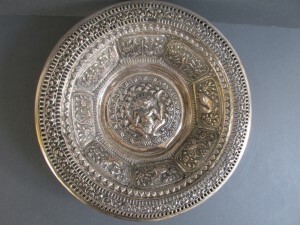 This Bali offer bowl is made of copper with an upper layer of silver. These bowls were used to bring flowers to the temples. See the last photo. 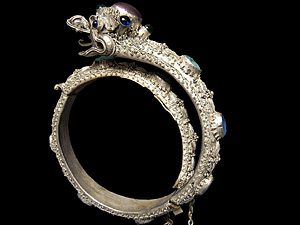 Silver bracelet made in the shape of a naga. Decorated with several gems. 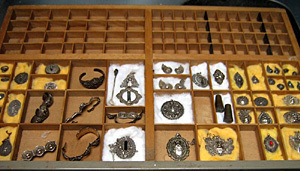 Collection of silver and juwelery from Bali, some very rare. Prewar juwelery. 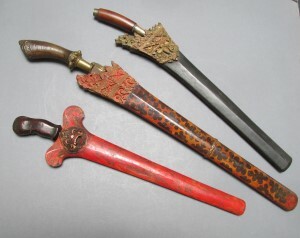 Most of them are made of silver, which is typical for prewar Bali juwelery. Unique collection, the result of 40 years collecting. On request a photo of every single item is available.